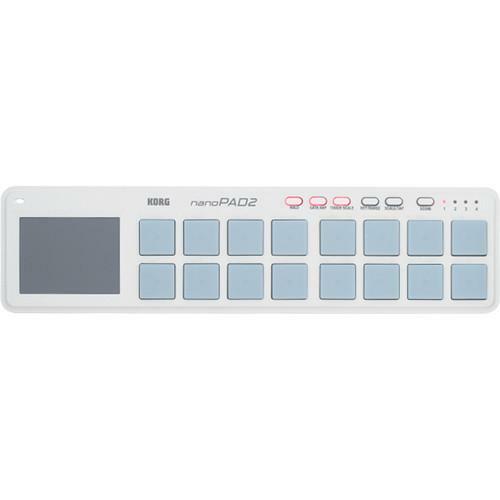 We recommend checking out our discussion threads on the Korg nanoPAD2 - Slim-Line USB MIDI Controller (Black) NANOPAD2BK, which address similar problems with connecting and setting up Drum Pad Controllers Korg. The user manual for the Korg nanoPAD2 - Slim-Line USB MIDI Controller (Black) NANOPAD2BK provides necessary instructions for the proper use of the product Pro Audio - Computer Audio - Drum Pad Controllers. The nanoPAD2 from Korg is an ultra-compact and low-profile pad controller, perfect for entering drum data and one that fits perfectly in front of a laptop or desktop computer keyboard. Using a single USB cable, the 16-pad controller offers impressive control while conserving valuable set-up space. The pads are velocity sensitive. The X-Y pad can be used to control multiple synthesizer parameters while a "Touch Scale" function allows for playing phrases on the touchpad. The controller is USB bus powered and with the appropriate connector kit (not included) the unit is compatible with Apple's iPad. Downloadable software allows for custom configuring the pad responses, and licenses are provided for 3 virtual instruments to facilitate immediate music creation. If you own a Korg drum pad controllers and have a user manual in electronic form, you can upload it to this website using the link on the right side of the screen. Box Dimensions (LxWxH) 14.5 x 3.9 x 1.6"
The user manual for the Korg nanoPAD2 - Slim-Line USB MIDI Controller (Black) NANOPAD2BK can be downloaded in .pdf format if it did not come with your new drum pad controllers, although the seller is required to supply one. It is also quite common that customers throw out the user manual with the box, or put the CD away somewhere and then can’t find it. 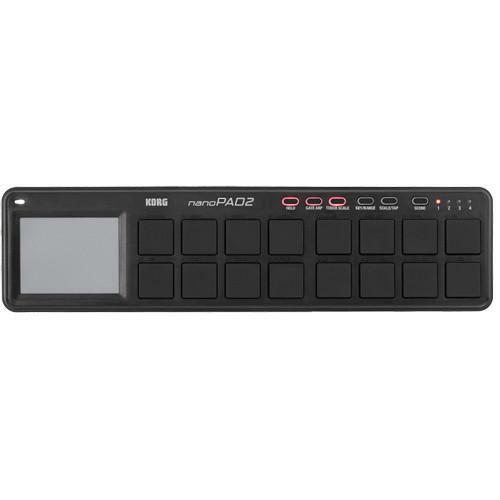 That’s why we and other Korg users keep a unique electronic library for Korg drum pad controllerss, where you can use our link to download the user manual for the Korg nanoPAD2 - Slim-Line USB MIDI Controller (Black) NANOPAD2BK. The user manual lists all of the functions of the Korg nanoPAD2 - Slim-Line USB MIDI Controller (Black) NANOPAD2BK, all the basic and advanced features and tells you how to use the drum pad controllers. The manual also provides troubleshooting for common problems. Even greater detail is provided by the service manual, which is not typically shipped with the product, but which can often be downloaded from Korg service. If you want to help expand our database, you can upload a link to this website to download a user manual or service manual, ideally in .pdf format. These pages are created by you – users of the Korg nanoPAD2 - Slim-Line USB MIDI Controller (Black) NANOPAD2BK. User manuals are also available on the Korg website under Pro Audio - Computer Audio - Drum Pad Controllers.